On 7 November 2017, the Parliament of Ukraine adopted the draft law № 6776-д “On amendments to the Tax Code concerning balancing of the budget revenues in 2018”. This law, among the other changes, outlines a 7-year plan (2018-2024) for increasing tobacco taxes. The law was transferred to the President’s office for signature. The text of the law is available at: http://w1.c1.rada.gov.ua/pls/zweb2/webproc4_1?pf3511=62878. The law increases the specific tobacco tax and minimum excise tax per 1000 cigarettes by 29.7% up to UAH 577.98 (18.6 €) and UAH 773.20 (23.6 €) respectively in 2018. In the next six years, specific tobacco taxes will be raised by 20% annually. Meanwhile, the Government’s obligation to request an annual inflation adjustment was changed from mandatory to optional. The main reason for adoption of this plan was the need to harmonize tobacco tax rates with the minimum EU tax levels, according to the Association Agreement of Ukraine with the EU. Public health arguments and the need to combat illicit trade were also cited as reasons for stronger policies. This legislation move was initiated by the Ministry of Finance and supported by the Tax and Customs Parliament Committee. Experts agree that this is an important move forward and a quite impressive tobacco tax increase plan. This could be perceived as a joint victory of the Government, policymakers, NGOs with expertise in this areas and several tobacco control and technical assistance institutions that have been working together last year to assist the Government in promoting this win-win strategy. The World Bank Group also contributed significantly to this positive outcome. Their experts explored and proposed different taxation scenarios. In September 2017, the WHO FCTC Secretariat was invited by the Government of Ukraine to conduct a joint needs assessment to evaluate the status of implementation of the WHO FCTC. The mission appreciated previous tobacco tax policies of Ukraine, and contributed to promoting that the Government’s tobacco tax initiative is tabled in the Parliament. 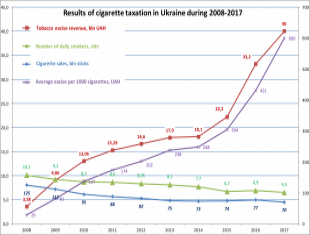 Ukraine has a positive experience in the past years of increasing tobacco taxes. In the period between 2008 and 2017, the average rate of excise duty on a packet of cigarettes increased by 20 times and the state budget revenues increased from 3.5 billion UAH to the projected 40 billion UAH in 2017. The number of smokers declined from 10 million to 6.5 million, according to the State Statistics Service. The GATS 2017 showed a 20% reduction in smoking prevalence among adults over the past 7 years in Ukraine.